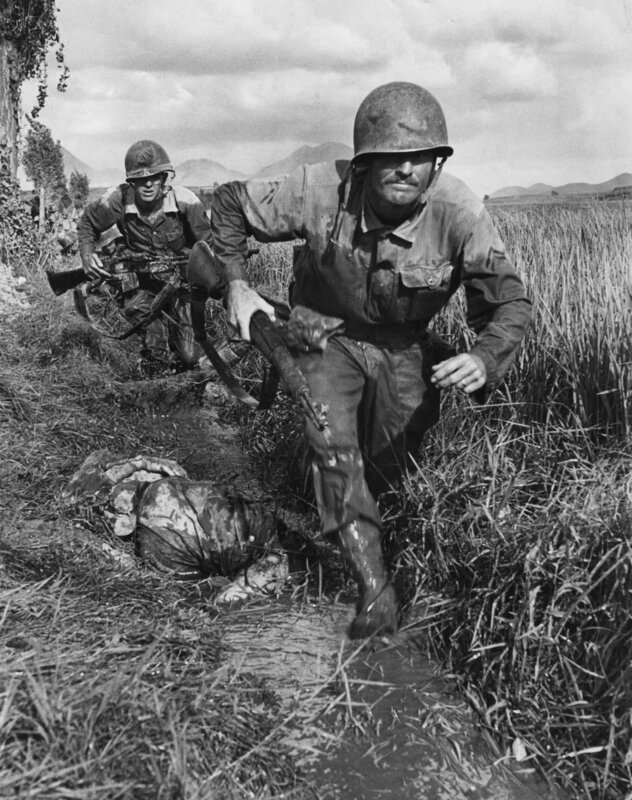 American Marines running past the body of an enemy soldier on the Korean Peninsula, September 1950. This week’s meeting between Kim Jong-un, North Korea’s leader, and his South Korean counterpart, President Moon Jae-in, seeks to ease decades-long tensions that flared into geopolitical conflict during the Korean War from 1950 to 1953. A particularly brutal conflict, it took the lives of an estimated three to four million people, many of them civilians, and left the Korean Peninsula devastated, particularly in the North, where roughly 25 percent of the population was believed to have been killed. Seoul, the South’s capital, now a booming megacity of 10 million, also suffered widespread destruction, changing hands four times. The conflict started when North Korea, which had the backing of the Soviet Union and China, invaded the South in June 1950 and quickly pushed South Korean forces to the southeastern tip of the Korean Peninsula. The United States, under the auspices of the United Nations and with troops led by Gen. Douglas MacArthur, invaded behind enemy lines in September at the coastal city of Incheon, pushing the North Korean forces back past their border. A particularly bloody stage of the conflict came after the allied forces drove the North Korean troops to the Chinese border, and China entered the conflict in October 1950. The ensuing fighting over the mountainous terrain of North Korea was known for its harsh conditions, especially in wintertime. For the next two years, the two sides fought to a standstill roughly centered on the area of the 38th parallel, the prewar dividing line between the two Koreas. The United States, North Korea and China agreed to an armistice in July 1953, which South Korea refused to sign. The armistice halted the military conflict but left the combatants still technically in a state of war that has lasted to this day. It also created the Demilitarized Zone that separates North and South Korea and is the site of Friday’s summit meeting.